The Literature Club, Vaikhari of GEMS College organized a two day literature camp, MASHI, at GEMS College from 16-3-2019 to 17-3-2019. All the director board members took part in the camp. Mrs. Smitha, Librarian, delivered the presidential address and college Vice Chairman Mr. Vasudevan inaugurated the camp. The camp was arranged in four sessions. The first session KAVYADHARA was handled by Mr. Ramesh Vattingavil, the winner of Vidyarangam award . Mr. Raghu M D, Asst. Professor, Dept. Of Multimedia, GEMS and Mr. Noufal , Asst. Professor, Dept. Of Multimedia, jointly handled the next session. On the second day Mr. Rajesh Monji , Asst. Professor, Dept. of Malayalam,MES College, Mampad, rendered a speech on Literature Is The Base For Every Art. Mrs. Maya Krishnan expressed the Self-conceptin stories in the last session. 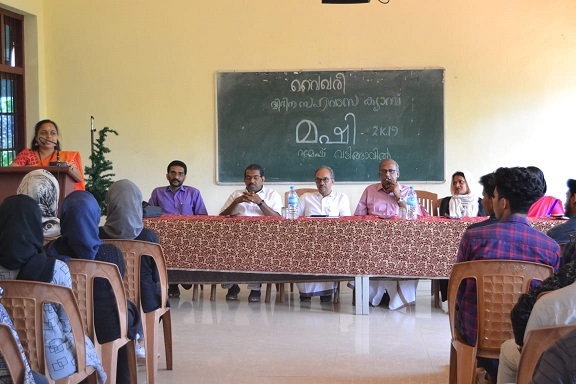 College Principal Mr. Naveen Mohan, Vice Principal Mr. Prem Daniel, Management, faculty members Mr. Raghu, Mr. Noufal, Mr.Rihas, Mrs. Seethal, Mrs. Archana, Mr. Najmudheen, and librarian Mr. Mahesh , Mrs. Usha and club members were actively participated in the camp.